Whatever Happened to Gun Control? The Newtown tragedy was supposed to change everything about gun politics. Why it didn’t—and how reformers might still win. Representative Elizabeth Esty’s blueprint for her first term in Congress changed as soon as Adam Lanza rampaged through Sandy Hook Elementary School. Elected five weeks earlier and not yet sworn in, she was suddenly thrust into a calamity that convulsed the nation. Esty was already familiar with how outside events—shocking crimes in particular—could change a political career in unforeseen ways. As a freshman in the Connecticut Legislature in 2009, she voted to abolish the state’s death penalty. But as her first term unfolded, so did the trial of a man accused and then convicted of a brutal home invasion in her hometown of Cheshire. A woman and her young daughters were raped and murdered; they were apparently chosen at random by two career criminals. The crime made international news and gripped the state, and Esty’s vote became an issue in her re-election campaign. M. Jodi Rell, the Republican governor at the time, vetoed the Legislature’s anti-capital-punishment bill and cited the Cheshire murders as the reason. A death-penalty verdict was handed down the same week as the election, and Esty lost her seat by two points. But all of that was far from Esty’s mind on the morning of December 14, 2012, as she sat in a classroom at Harvard’s Kennedy School of Government. Freshly elected to represent Connecticut’s Fifth Congressional District on a platform of bread-and-butter issues, Esty and some forty other incoming members of the House were receiving a training session on using social media. Around 10 am, a Harvard staffer tapped her on the shoulder and said there’d been a school shooting in Connecticut. There was some initial confusion about exactly what had happened, and the staffer kept saying “Newton,” like the city outside of Boston, so Esty wasn’t sure even that the incident had occurred in her state. But it soon became clear that there had been an appalling number of deaths, and that it had happened in Newtown—right in her district. “At that point, I just left the room, went to my hotel room, threw my things in a suitcase and drove straight to Newtown,” Esty told me over lunch there late this summer. The interview had been undramatic and upbeat to this point, but the tears began to well in her eyes. She described calling her mother and her minister on the two-hour drive home. Soon, the whole world was there. “You could not walk two feet without hitting a national or international anchorperson. There were satellite dishes; there were gawkers. It was beyond horrific,” she said. Once in Congress, Esty became a dogged proponent of tougher gun laws. She was named a vice chair of the Congressional Gun Violence Prevention Task Force. She co-sponsored a raft of gun-violence prevention bills in the House, including the only gun-control measure to pass Congress after Newtown—a bill to provide $19.5 million to improve the federal background-check system, which passed this spring as an amendment to a Justice Department appropriations bill. But twenty-one months after the shootings and with the midterm elections approaching, Esty is facing a situation that would have seemed absurd and even impossible in those days: her opponent, Mark Greenberg, opposes new federal gun laws. Newtown was supposed to change everything—and for a moment, it appeared it had. Support inside Connecticut for stricter gun laws approached 60 percent in the months after the shooting. In April 2013, a package of reforms touted as the “toughest gun laws in the country” passed the Legislature with wide bipartisan support and was signed into law by Democratic Governor Dannel Malloy. But now, most polls show Malloy trailing his Republican opponent, Tom Foley, who opposes new gun laws. Foley won the GOP primary after receiving the backing of state gun-rights groups, defeating a fellow Republican and state senator who helped shepherd the post-Newtown gun laws. As for Greenberg, while he doesn’t crusade on the issue, he doesn’t hide his opposition to gun-law reform either—and while Esty is expected to hold her seat, she is one of twenty-five Democrats that the Democratic Congressional Campaign Committee considers at risk of an upset. It certainly didn’t look like things would turn out this way. In the days after the shootings, almost everyone involved in the gun debate anticipated big changes. The National Rifle Association’s Wayne LaPierre may have blustered publicly against gun control, but as The New York Times later reported, the NRA’s top lobbyists were negotiating with the White House and Senate Democrats on background-check legislation under the assumption that it was inevitable. And the popular consensus was that tougher restrictions were on the way: FBI data showed that more guns were purchased on December 21, 2012, than on any preceding day, as people worried that it might be their last chance to buy whatever firearms they wanted. But persistent misinformation and agitation by far-right members of Congress and gun groups even more rigid than the NRA slowly doomed the effort. Republicans who said they’d support background-check legislation started to waver, often citing bogus fears of a national gun registry that the bill explicitly forbade. 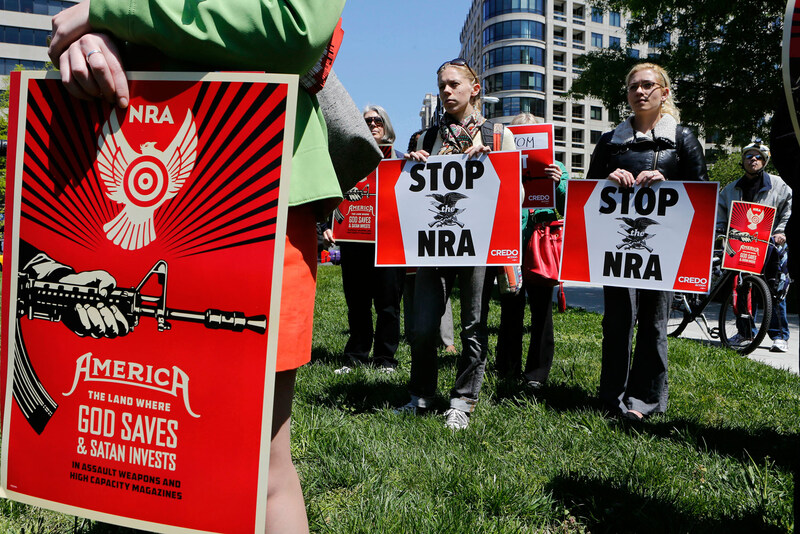 The NRA began feeling the heat from groups like Gun Owners of America, which urged a no-compromise approach, and its lobbyists dropped out of the negotiations. By the time the bill reached the Senate floor, everybody knew it wouldn’t pass. And with no bipartisan Senate bill on his desk, House Speaker John Boehner was free to never talk about reform again. Using Obama as a means to link Tennant to gun control is a curiously circuitous route; Tennant explicitly supports expanded background checks, which would seem a much more direct target. There are reasons, perhaps, for Moore Capito to tread lightly here: the Senate’s universal background-check legislation was famously co-sponsored by the state’s other US senator, Joe Manchin, who has remained relatively popular despite the millions of dollars in NRA ads targeting him during and after the Senate debate. Does this mean that Tennant, for her part, is eager to engage on the issue? Not really. She makes her position on background checks clear on her website, but hasn’t made it a campaign issue. This is the state of gun-control politics in 2014: candidates from both sides are approaching the issue with extreme caution. In Virginia, Republican Senate candidate Ed Gillespie makes only a passing mention of opposing gun control on his website. When the NRA blanketed Virginia with a pro-Gillespie mailer in late August, promising that the candidate would “strongly oppose and fight against [President Obama’s] anti-gun nominees for the U.S. Supreme Court,” area newspapers immediately speculated that the mailer “could have unintended consequences for Gillespie” as he seeks to win over moderate Virginia voters. But the incumbent, Senator Mark Warner, isn’t saying much about his vote for background checks either. Indeed, it’s primarily outside groups that are inserting gun control into the midterm elections. The NRA and its gargantuan $250 million budget will surely be a big player once again, but Newtown spurred the creation of new (and well-funded) pro-reform groups. That’s the one bright spot in a political landscape that is otherwise frustrating for many activists and gun-violence victims: outside pro-reform groups are finally battling the previously unchallenged power of the NRA and learning how to target voters in more sophisticated ways. On the state level, there are bold ballot initiatives and signs of a real sea change on gun laws. And perhaps most important, what happened at Sandy Hook Elementary School may have transformed a casual pro-gun-control constituency into a real political movement. I met Pia Carusone at the Washington, DC, office of Americans for Responsible Solutions (ARS), which was founded by former Representative Gabby Giffords and her husband, Mark Kelly, two months after the Sandy Hook shooting. Their office has fourteen staffers, mostly young people, and hopes to raise $20 million for the midterms. The conference room we sat in was covered with front-page articles about mass shootings from newspapers around the country. They all shared an eerie similarity: screaming headlines and pictures of people weeping or standing agape with hands over their mouths. In the meantime, ARS is trying to figure out which voters should be targeted on the issue of gun control and how best to do it. Ninety percent of the public supports expanded background checks, but who among them would vote on that issue alone? After sifting through the results of the 2013 statewide races in Virginia, Carusone thinks that ARS might have an answer: not only did independent women and non-college-educated women voters swing those contests; they were uniquely receptive to messages in favor of gun-law reform. (Democratic candidate Terry McAuliffe, now the state’s governor, didn’t shy away from talking about gun control.) “For that group, it was a very big motivating issue,” Carusone said. And this could be big in the midterms: in the hotly contested state of North Carolina, for example, ARS found that almost 90 percent of suburban women favor background checks. Accordingly, ARS has ramped up its outreach to women on specific issues like the links between guns, domestic abuse and violence against women. One of the group’s first ad buys, in the Arizona district that Giffords used to represent, features a mom whose daughter was shot dead “by a man with a criminal record.” The group has also been working to inform female voters that the gun lobby’s efforts to expand open-carry laws would allow weapons in libraries and daycare centers, among other places. An untold story of the post-Newtown debate over gun control is how much happened at the state level: while the national media deemed gun control impossible after Congress failed to act, eight states made significant or sweeping changes to gun laws, while only four states significantly weakened them, according to analysis by the Law Center to Prevent Gun Violence. Mark Follman at Mother Jones crunched the numbers and found that more than half of all Americans now live in a state with stronger gun control laws than existed before Newtown. The 2014 midterms could bring about even more change. In Washington State, a ballot initiative to institute universal background checks is enjoying overwhelming support among voters. The campaign to pass the initiative has raised more than $7 million, including seven-figure donations from both Everytown and former Microsoft chair Bill Gates. A pro-gun group pushing another ballot initiative that would essentially negate any new background-check laws has raised only $1 million. In Illinois, voters will decide on a nonbinding referendum calling for the state to expand background checks and to outlaw assault weapons. In Nevada, activists are gathering signatures to put a binding background-checks initiative on the ballot in 2016. This could become a crucial national focal point, since Nevada will be hotly contested by presidential candidates in both the primary and general elections that year. Ultimately, however, the biggest prospects for change reside in Washington, DC. About 32,000 annual gun deaths touch virtually every district in the country, and the capital city itself is intimately familiar with gun violence. Like some dystopian future of guns run amok, local authorities have installed sensors throughout the city that can pinpoint and triangulate frequent gunfire and direct police to its location. The Urban Institute looked at the reports that the system collected and found that 54 percent of the gunshots were within 1,000 feet of a school. Still, Congress probably won’t act soon. A senior Senate aide told me that majority leader Harry Reid “strongly desires a first successful vote on the bill rather than a second unsuccessful defeat.” With the Democrats fighting just to hold on to the chamber, that makes it unlikely in the foreseeable future. And with the House very likely to stay Republican, it’s hard to imagine Speaker John Boehner feeling any pressure to act (though most observers agree that if he did bring a background-check bill to the floor, it would pass). Esty, for her part, remains optimistic that she’ll return to the fight. Of all the donors who contributed through late July, every single one from Newtown gave to her campaign; not one donated to Greenberg, which is remarkable given how close her race was in 2012. *This article has been corrected to better reflect the role of reform groups in the Starbucks campaign.